Other Products by Carusos Natural Health. Search other Curcumin Supplements products. Caruso’s Super Curcumin Arthritis Relief is a natural Turmeric extract to assist with the symptoms of pain and immobility of osteoarthritis, inflammation and stiffness. 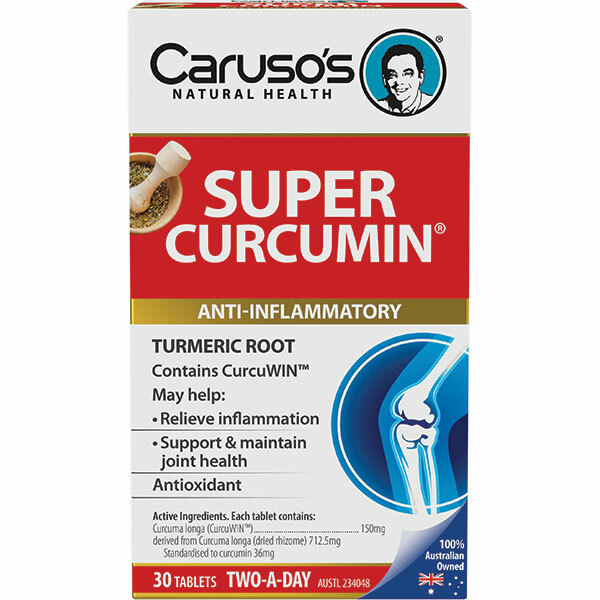 Caruso’s Super Curcumin Arthritis Relief utilises advanced technology to enhance the bioavailability and absorption of the special Curcumin extract called CurcuWIN™. CurcuWIN™ is 46x more bioavailable than the leading source of Turmeric on the market, allowing it to aid with the overall symptoms of those suffering from osteoarthritis. Why is Caruso’s Super Curcumin Arthritis Relief so much more effective? Curcumin must be absorbed by the cells of your body to benefit your health. Caruso’s Super Curcumin Arthritis Relief utilises advanced technology to enhance bioavailability and absorbability. It undergoes a special patented technology process which delivers superior absorption and bioavailability. A clinical trial1 found the serum Curcominoid levels in the Curcumin used in Caruso’s Super Curcumin Arthritis Relief was forty six times more absorbable than regular Curcumin. This Curcumin, known as CurcuWIN™, was also shown to be significantly more bioavailable than other enhanced Curcumin ingredients. You can rely on Caruso’s Natural Health to give you a regulated Curcumin formula, which has the highest standards of quality, purity and potency. If you’re suffering from the pain, inflammation and stiffness of Osteoarthritis, try Caruso’s Super Curcumin Arthritis Relief today. 1. Jäger et al. : Comparative absorption of Curcumin formulations. Nutritional Journal 2014 13:11.
Who would use Caruso’s Super Curcumin Arthritis Relief? Free from: sugar, dairy, lactose, gluten, yeast, wheat, soy, corn, starch,or preservatives.